Pillalamarri Banyan tree looks almost like a hillock from a distance, with green foliage. 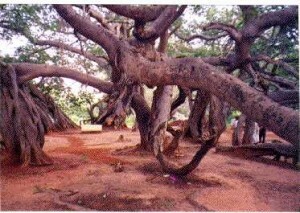 The Banyan tree is stated to be hundreds of years old and spreads over an area of about three acres. It looks like a large green umbrella under which about a thousand people can take shelter comfortable. Pillalamarri is located near Mahboobnagar, about 8 km. from the town. This entry was posted in Andhra Pradesh, Pillalamarri. Bookmark the permalink.